A “field watch” can be defined as a robustly built, intentionally unadorned timepiece with an easily deciphered dial and a deliberate lack of complications. The field watch, also known as an officer’s watch, is the quintessential weekend wear for anyone who appreciates functionality and classic aesthetics. These are the staples on which Weiss Watch Company watches are built. Each Weiss timepiece is assembled and decorated by master watchmaker Cameron Weiss from start to finish. The Weiss Watch Company is proud to offer mechanical timepieces built in the USA. Each mechanical movement used is comprised of Swiss parts that are hand-finished and assembled in Los Angeles, California. 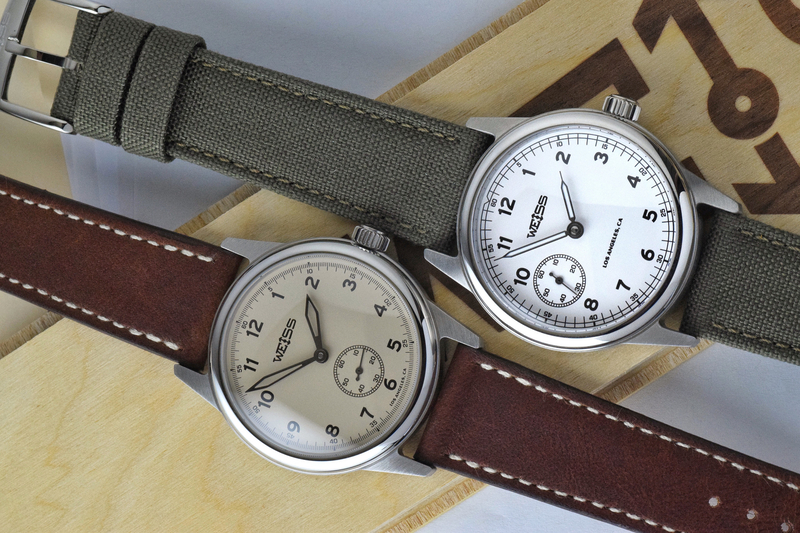 In this review, two Weiss watch models will be compared and contrasted side by side. The brand new 38 mm Standard Issue Manual Wind Field Watch with Latte Dial on Brown Horween Leather ($1,250) and the previously released 38 mm Automatic Issue Field Watch White Dial on olive green Cordura canvas strap ($1,850). For the manual wind field watch, a caliber 1005 mechanical movement is used, which is based on the ETA 7001. (The company does equip some of their watches with in-house movements.) 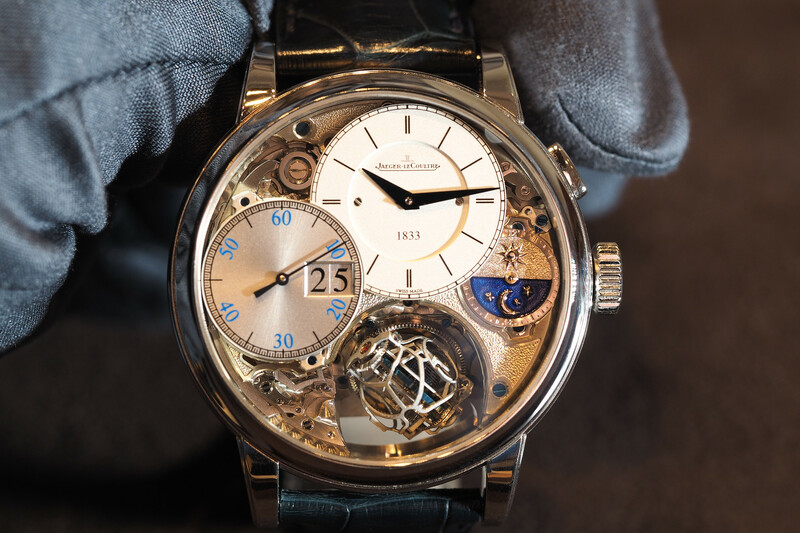 Each movement is comprised of over 100 Swiss parts hand-finished and assembled in Los Angeles, California. 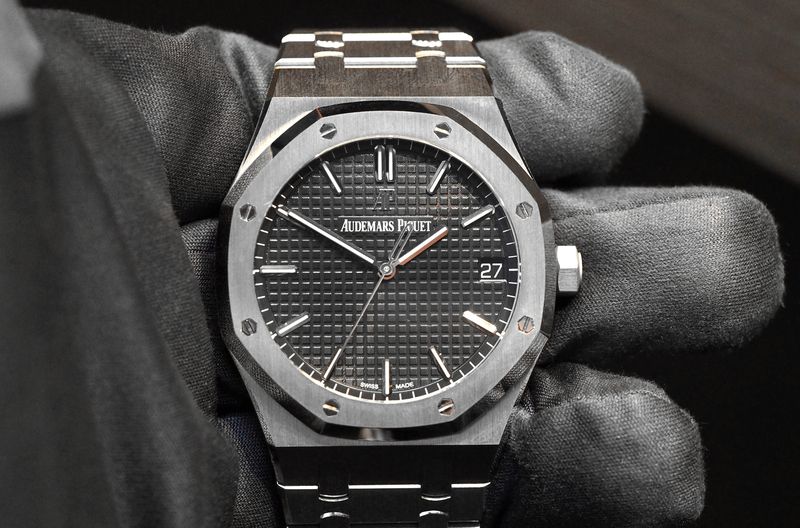 The movement oscillates at 3.5Hz (21,600 vph) with a 42-hour power reserve. Sweep seconds at 6 and Incabloc shock protection are utilized. With the automatic timepiece, a Caliber 2100 automatic movement is used. This is a self-winding mechanical movement comprised of over 150 Swiss parts along with American made components. All are hand-finished and assembled in Los Angeles. The caliber 2100 is based on the Swiss Eterna caliber 39, which beats at 4Hz (28,800 vph) with a 65-hour power reserve. A small second hand at 9 with hacking feature and built-in shock protection are used for this model. The case and caseback of the manual timepiece are machined from one solid piece of surgical grade 316L stainless steel and polished individually by hand. The case measures in at a 38 mm diameter (not including crown), 46.6 mm lug end to lug end and only a 9.7 mm thickness at the highest point of the domed and beveled sapphire crystal. The crystal has multi-layer anti-reflective coating on the inner surface. A sapphire crystal is also used for the exhibition case back. Lug width is a universally interchangeable 20 mm. The water resistance is respectable at 100 meters. The field watch, also known as an officer’s watch, is the quintessential weekend wear for anyone who appreciates functionality and classic aesthetics. For the manual edition, the latte dials have been machined from one solid piece of naval brass that is then hand painted in the latte color with black numerals. The clean design, along with skeletonized black steel hands, help to maximize legibility. The strap provided on this model is a brown Horween leather 20 mm lug, 18 mm buckle, made in the USA. 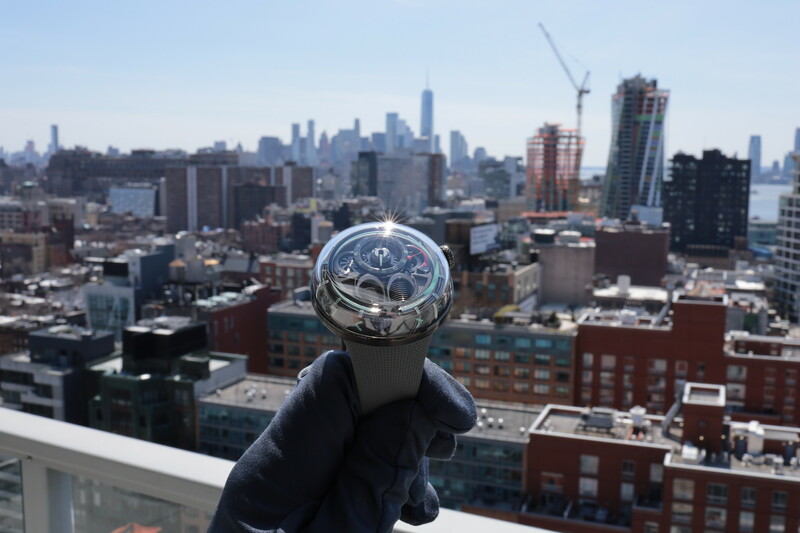 The watch weighs in at an ultra light 54 grams. Many of the case features of the Weiss 38 mm Automatic Issue Field Watch are identical to the manual’s specifications with one notable exception. The case is the approximate same 38 mm diameter (not including crown) and 46.7 mm lug end to lug end. The major difference, a much increased 13.4 mm thickness from the highest point of the double-domed and beveled sapphire crystal. The difference in height here is due to the disparity in the thickness of the varying movements used between the two models. There appears to be no AR coating on the automatic model’s sapphire crystal, which is apparent during photography. As with the manual model, the case and caseback are machined from a solid piece of stainless steel and polished individually. A sapphire crystal is once again used on the back of the case, both for durability and to display the caliber 2100 automatic movement. The hands on the automatic models are black oxide treated steel with luminescent paint for low light legibility. Dials here are also machined from one solid piece of naval brass and then hand painted. As with the manual version, water resistance is 330 feet/ 100 meters. The Automatic Issue Field Watch is supplied with a waterproof olive green 20/18 mm Cordura canvas strap. Even with the increased case thickness, the automatic version weighs a very comfortable 74 grams, only 20 grams more than the much thinner manual. Both the Standard Issue Manual Field Watch and the Automatic Issue Field Watch are limited production watches, each assembled by hand, individually numbered and delivered in a custom California pine wood box, built in the USA and come with a 2-Year warranty. On the wrist, I have to say I really enjoyed both models. At 38 mm with a 6.75-inch wrist, the case size is, well, just perfect for me. After years of adjusting, 36-40 mm is my personal sweet spot, and this is dead center, so I may be biased there. The aesthetics of both are undeniably “field watch,” and if you are in the market for one you will not be disappointed with either model. Although many other durable field watches can be found for much less than the price point of these, no bargain beater can hold a candle to the type of thought and craftsmanship put into these timepieces. That being said, the exhibition case backs of both models add nicely to the overall presentation of the timepieces but slightly underwhelm due to a sparsity of details on the movements, particularly the automatic. That can also be considered the charm, especially on the automatic model with its oversized rotor adorned with a Weiss cutout. While I thought the vastly thinner case of the manual was more comfortable on the wrist, I felt it wore slightly longer than the automatic likely due to the auto’s tall stature. For me, the shorter wearing, although the much taller case of the automatic felt more “right” on the wrist after wearing both for an extended period. It must be mentioned my Instagram #watchfam, that as far as photographing goes, I found both to be difficult to capture due to their reflective crystals. The automatic was slightly more troublesome, likely due to its lack of or less AR coating. After handling both, I am likely adding a Weiss to my collection, the danger of being both a reviewer and a watch collecting addict. Both models check most, if not all, field watch boxes. In the end, I personally give a slight nod to the automatic issue over the manual, likely due to its syringe hands and hacking seconds at nine although I would not mind sipping some latte every now and then. Learn more about the 38 mm Standard Issue Field watch with latte dial ($1250) and the 38 mm Automatic Issue Field Watch with white dial ($1850). Orthodontist, watch collector, author, photographer. Learn more on Instagram @kicktoc.